If you don’t have an IT department, Leapfrog can become it. Single-Source IT Management from Leapfrog covers your entire IT ecosystem. From infrastructure to your apps, from cybersecurity to device procurement, Leapfrog’s experienced team manages 100% of your IT so you can focus 100% on your business. Optimizing your IT is the key. 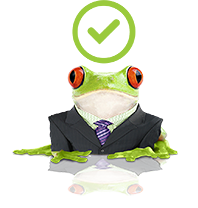 With optimized IT and friendly frogs on your side, your network becomes the smooth-flowing, glitch-avoiding, always-on, secure IT ecosystem you’ve always wanted. You don’t have to think about it. You can just leap farther. Hard to believe, perhaps, but our tech frogs find every morsel of your IT pond delicious — especially finding and fixing the problems. If any part of your optimized IT ecosystem hits a bump, we’ll smooth it out, usually before you even notice. If you’re concerned about hackers (who isn’t? ), our built-in security and compliance processes are second to none. If someone on your team has a problem with IT, our Help Desk team fixes it right away — 95% of calls are answered by a human in under 60 seconds and more than 80% of problems are resolved during the first call. If your leadership wants advice on how to leverage IT for business growth, you have a dedicated client service representative and a pond full of subject matter experts proactively looking out for your best business interests. And if you want to review every last detail of your network log — welcome to our world! We’re completely transparent and accountable. We report on everything and provide summaries, too. When you don’t have the time to deal with IT, it’s time to call Leapfrog. We’ve been partnering with companies to expertly manage their entire IT ecosystem since 1998 — it’s why we went into business, why we were one of the first companies to pioneer remote IT management over the Internet, and why we enjoy a 95% retention rate. We believe wholeheartedly in a culture of service, the concept of IT optimization and the philosophy that IT should empower your business instead of get in the way. Plus we’re super-friendly and fun — the last thing you need is technical jargon and attitude. If you have an in-house IT department, you can use our Managed IT services to solve specific challenges and support your IT team.